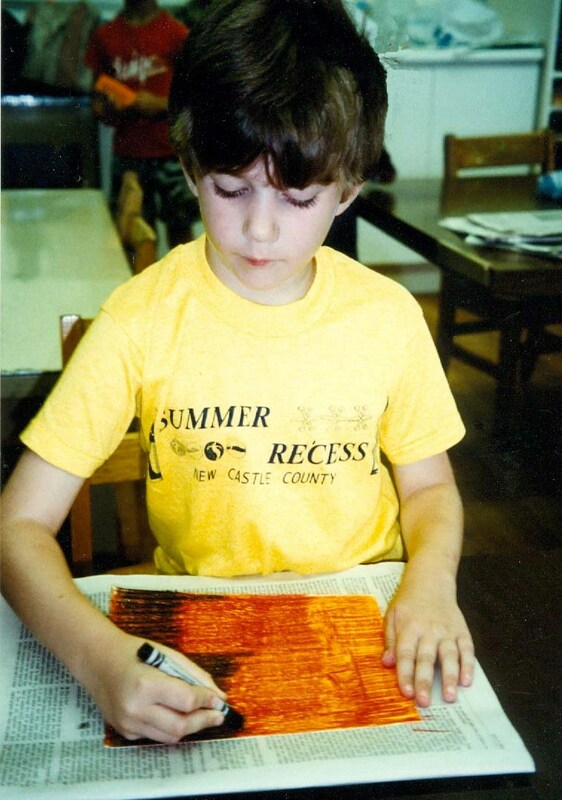 After applying several layers of crayon to their papers, the children make engravings, filling them with patterns and textures. For ages 6 to 13. Plan 2 sessions. Note: Test the crayons before the lesson to be sure they have strong colors and sufficient wax content. Crayola crayons were used in this project. 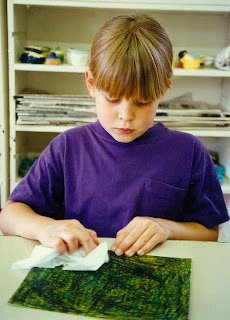 Cut the paper into 8- by 10-inch pieces, planning one for each child plus one for demonstrating. Set out paper, crayons, newspaper pads, and tissues. 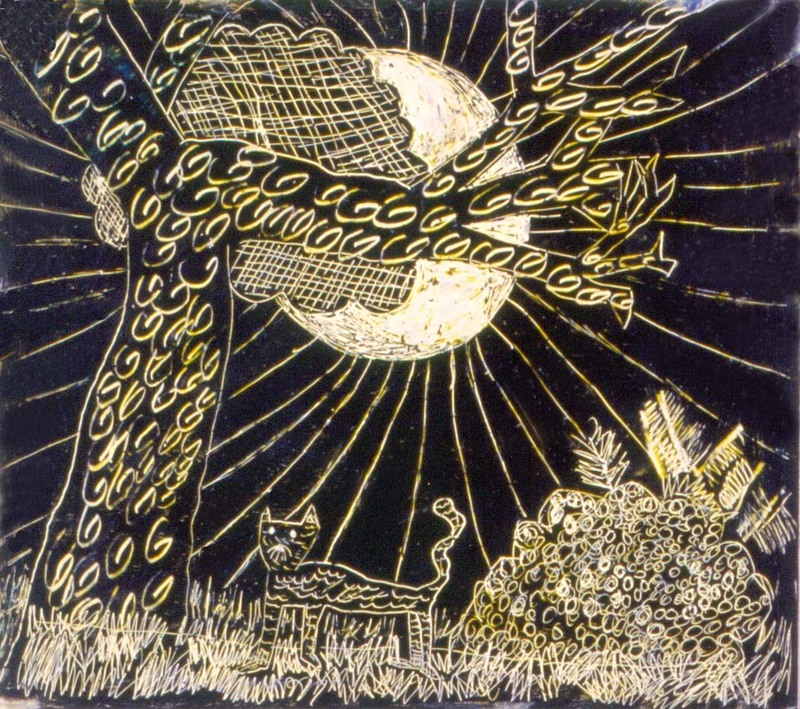 Explain to the children that an engraving is made by scratching a design into a surface to produce a picture. In this session the children will apply layers of crayon to their papers, and in the next session they will scratch drawings into the crayon to make engravings. Demonstrate how to prepare the paper by first placing it on a newspaper pad. Then choose three or four colors of crayon that are in sequence with each other, such as pink, red, and black, or yellow, green, and navy blue. Starting with the lightest color, completely cover the glossy side of the paper, leaving no white areas. Apply the crayon in short, swift strokes with a firm pressure. The first layer of crayon is the most important because without enough wax build-up the engraving will not work. Apply the successive layers of crayon, going from light to dark. If the bottom layers begin to peel while working, change the direction of the strokes and use slightly less pressure. Show the children how to burnish, or polish, their final layer of crayon by rubbing it with a tissue in a circular motion to create a clean, smooth, and shiny surface for their drawings. Have the children apply the layers of crayon to their papers and then burnish the surface. Be sure the children have their names on the back of their papers before storing them for the next session. Set out the prepared papers from the previous session. Have ready a prepared paper for demonstrating the use of the engraving tools. Set out tools for engraving. Explain that in this session, the children will be making their engravings by using tools to scratch through the layers of crayon. Engravings are most effective when there is an abundance of details filling the papers. Discuss the details, patterns (designs made by repeating symbols), and textures (the actual or visual feel of a surface) in everything around us, such as wallpaper, fabric, wrapping paper, leaves on a tree, bricks of a building, stars in the sky. Have the children plan the compositions, or structures, for their pictures before beginning to draw on the prepared papers. On the demonstration paper, show the children the variety of lines that can be achieved by using different tools and how the colors change depending on the amount of pressure used. 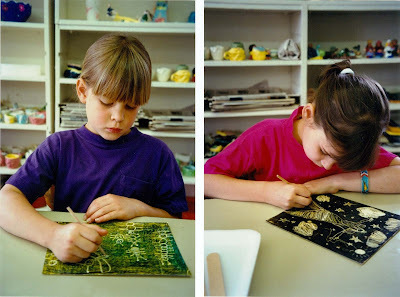 Explain that the children should begin their engravings by first drawing their compositions on the prepared papers using simple line drawings and then adding patterns and textures. Solid areas can be scratched out using the wider tools, allowing the marks of the tool to show. 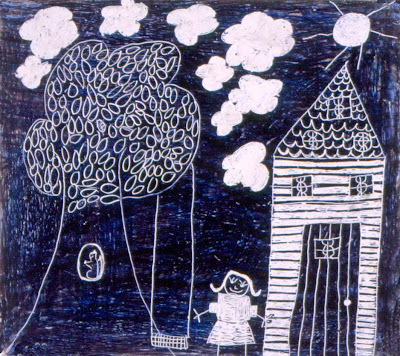 Have the children plan their compositions and make their engravings. Encourage them to work in all sections of the paper, gradually building up details and patterns to keep the designs balanced. Multicrayon engravings add an interesting dimension to the common crayon and give the children a chance to explore a familiar medium. Although this project is similar to using commercial scratch-art paper, having the children prepare their own papers gives them a better understanding of the engraving process and the final results will have a softer look. When doing the demonstration, it will take too long to completely cover a whole paper. It's enough to carefully cover a section of the paper for the children to see how to pack in the crayon and put one layer of crayon on top of another. This project works best when the first color used is a very light shade which is applied heavily to produce a solid wax build-up. The final layer should be a dark color, such as black, navy blue, or brown. It is important that the children make plans for their compositions before starting their engravings. This can be done either mentally or by making simple line sketches on pieces of scrap paper. Add details, patterns, and textures only to the final drawings on the prepared papers. 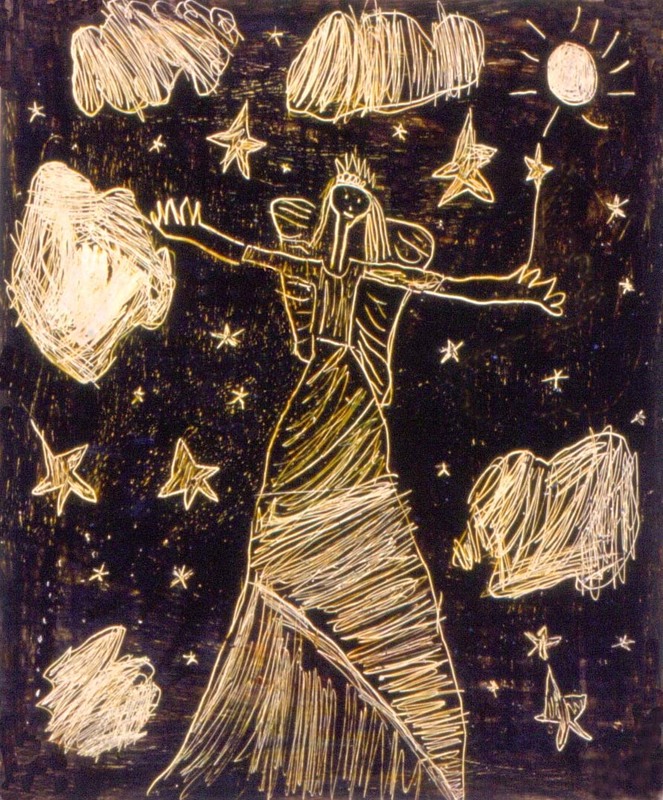 Were the papers prepared with sufficient layers of crayon to make the engravings? 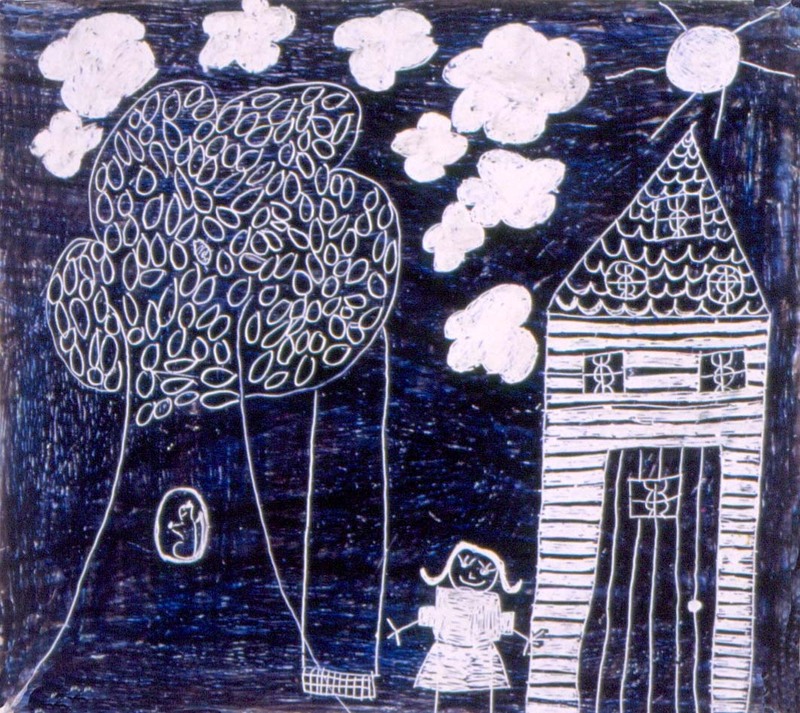 Point out some of the ways the children used patterns and textures to fill their compositions. Discuss the added interest that the details, patterns, and textures give to the engravings. Is my paper covered enough? My hand is getting very tired. When I try to put on the second color, the first color keeps peeling off. I think two colors will be enough. I’m ready to draw my picture. I drew this shape wrong. Can I erase it? Making all the leaves on this tree took a long time, but I really like it. Your paper is covered enough if there is a thick coating of crayon all over the surface with no white areas showing. Try coloring each layer of crayon in a different direction to avoid having the bottom layers peel off. You can decide how many layers of crayon to use on your paper as long as the layers are applied thickly and evenly. However, extra colors will look nice on your engraving and we will not be drawing the pictures until the next session. It’s best to work with your original lines; any mistakes will probably disappear as you add the patterns and textures. You can try to make small changes by reapplying the crayon. Adding detail like the leaves on the tree makes your engraving more interesting to look at and enjoy.